Am both delighted and astonished that Songwriter’s Beat is 13 years old! When I started the night there was no way to know that we would last this long, that 360+ songwriters would grace our stage, that hundreds – hundreds! – of new songs would make their debut at Songwriter’s Beat. So we have a LOT to celebrate. This year’s anniversary concert brings together incredible artists: after years of coaxing, my longtime Ashford & Simpson bandmate, oustanding bassist/writer/producer ‘Tinkr’ Barfield is joining us for the first time! And the phenomenal MazzMuse (currently on tour with Valerie June) will bring her solo violin project to our stage, along with Songwriter’s Beat family, UK born Rupert Wates, one of the most prolific and hardest working performing songwriters out there. Australia’s acclaimed Emma Dean was also scheduled to join us, but unfortunately she had to return to Oz early. We’re saving a spot for Emma next time she’s in NYC! On this happy occasion I will try out some of my newest material, as well as a song or two from my upcoming solo CD, Muse. This means brand-new songs folks, songs that have yet to be played – EVER! – outside of my own living room! Here are all the details – join us! 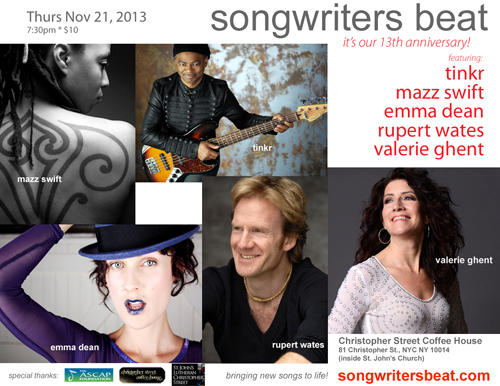 My gratitude and humble thanks to the hundreds of artists who have made Songwriter’s Beat into one of NYC’s premiere nights for performing songwriters over these 13 wonderful years! I love you all!